I would be very interested in what you have to say about liver/gallbladder flushes, and I believe there is a liver cleanse. How does it differ from a flush and how do we keep our livers clean? The liver flush is a detoxification method and is also used as a natural treatment for eliminating gallstones. There are many variations to a liver/gallbladder flush, but it typically involves drinking two glasses of organic apple juice every two hours for two days. In addition, you are advised to eat only fruits and vegetables. At the end of the two days, you take one to two tablespoons of Epsom salt dissolved in water, followed by half a cup of olive oil with lemon juice at bedtime. How does the liver flush work? Apple juice is high in malic acid and is believed to act as a solvent to weaken adhesions between solid globules. Epsom salt (magnesium sulfate) relaxes smooth muscle and will dilate the bile duct to enable solid particles (like gallstones) to leave the gallbladder. The olive oil is then taken to stimulate the gallbladder and bile duct to contract and expel gallstones. Results of the liver flush? After taking the olive oil, people often notice small balls in their stool, ranging in size and color. Some advocates of the liver flush believe these balls are gallstones. However, others (including some reputable Naturopathic Doctors), say that the balls are not really gallstones but rather are merely produced within the digestive tract. Many people have reported benefits of this type of liver flush, which often include more energy, better sleep, greater mental clarity, healthier skin and hair, and decreased body pain, such as headaches or joint aches. 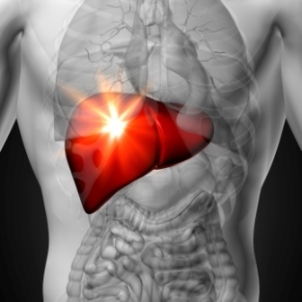 Side effects of the liver flush may include nausea, vomiting, diarrhea and abdominal cramps. What do I think of this liver flush? I have done it in the past a few times and I certainly don’t enjoy the process. In order to consider doing it again, I would want to know for sure that it does, in fact, eliminate gallstones. I have not seen anything clinically to prove that what are removed are actually gallstones. In fact, I did not see any stones at all when I did it. In addition, that much apple juice is just too much concentrated sugar for most people, especially those with existing blood sugar imbalances or yeast overgrowth. I am not sure which liver cleanse you are referring to, but most liver cleanses involve a restrictive diet along with detoxification formulas targeted for the liver. Several amino acids are essential in the liver detoxification process, such as L-Methionine, L-Cysteine and L-Glutathione. Herbal formulas that are famous for their ability to stimulate, cleanse and protect the liver and gallbladder often include one or more of the following: milk thistle, Oregon grape root, artichoke leaf, gentian root, wormwood leaf and dandelion root. Garlic, oregano oil, clove, black walnut hull and wormwood are anti-parasitical plants, which also support liver detox. In general, when it comes to cleansing and detoxification, I prefer whole body cleanses because I believe they support the natural processes in the body better than specific organ cleanses. However, if you do decide to do a liver cleanse, I highly recommend that you always precede it with a colon cleanse, such as colon hydrotherapy (colonic) or an oxygen-based colon cleanse (my favorite) or a high-quality herb-based colon cleanse. It is critical with any type of cleanse to be sure that the body can effectively remove the toxins. It does not do any good to do a liver cleanse, for example, if you are constipated. Thus, I would not recommend doing any type of cleanse unless you are committed to drinking at least half your body weight in ounces of clean, filtered water before, during, and after the cleanse! In addition, it is essential after any cleanse to take a high-quality probiotic for at least two months to replenish good bacteria in the gut. The good news is that our bodies are designed to effectively remove toxins. They work tirelessly at removing toxins all the time. In fact, every time we urinate, defecate, exhale, cough, sneeze, or sweat, our bodies eliminate toxins from the system. Since the liver is the master organ of detoxification, the best way to support the liver is by supporting all of the eliminative functions of the body. This means: (1) drinking enough water daily to stay hydrated for optimal removal of toxins through the urine and bowels, (2) exhaling completely and fully many times a day, (3) exercising enough to break a sweat and (4) keeping the colon clean by eating an abundance of fresh fruits and vegetables, as well as a moderate amount of sprouted grains, nuts and seeds. I believe it is helpful to do periodic colon cleanses or to have colon hydrotherapy (colonic). In addition, a simple and inexpensive way to daily cleanse the liver is by drinking a glass of fresh-squeezed lemon juice first thing in the morning.